Leading Exporter of sesame oil from Delhi. 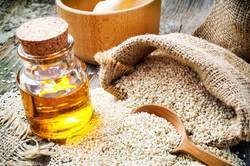 We are highly renowned and reputed manufacturers of natural and pure Sesame Oil that is extra light and chemical free. Plus, it is developed from effective technology and can be easily absorbed by the body. Our products are developed in hygienic conditions and have the ability to lubricate and tone the skin, muscles and joints. They are popular among clients’ and can also improve blood circulation; helps in removing toxins from the blood; elevate energy levels; help calm the mind and nerves and sharpen the mind. They are offered at the best available prices. Looking for Herbal Oils ?